According to reports, Arsenal are preparing a last minute move on Ousmane Dembele with an offer of £89million with the transfer window closing in a few days. Reports claim that Arsenal’s coach Unai Emery has convinced the club for a last-minute move. The Frenchman has been repeatedly linked with a move to the Emirates this summer due to speculations arising from the player being seen with a couple of Arsenal’s players in London dining together. However, Dembele has been reported to have returned to Barcelona and seen training with hint of trying to win his place back in his club, other reports claims Manchester United are also targeting the Barca outcast. 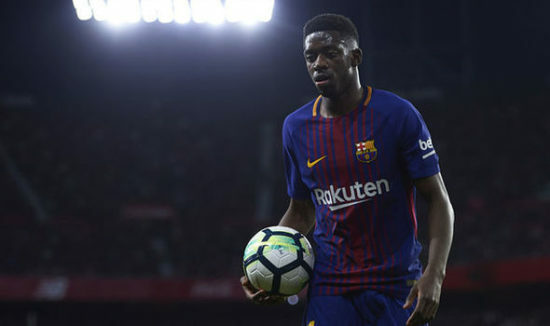 But according to Catalan newspaper Mundo Deportivo, all that has not affected the Gunners zeal about the player and are ready to throw-in efforts at Barcelona for one final offer attempt into selling Dembele. With a far spent transfer budget for this summer, Arsenal have made a tempting offer of an initial £8.9million loan fee with a compulsory clause which is to make the deal permanent for £80.3million next summer. Emery believes that the 21-years old French International can bring in the much needed dynamics to the attacking play of the Gunners. Meanwhile, Arsenal ploy to tempt Barcelona into signing before Thursday’s Premier League deadline, maybe worthwhile if Barca needs to cash-in to pursue Manchester United midfielder Paul Pogba.